This entry was posted on May 8, 2014 by Jessica Anderson. In honor of Teacher Appreciation this week, today's blog discusses ways to honor educators. Next to parents, teachers and other school staff spend the most time with our children each day and have a major impact on our child’s development and intellectual growth. 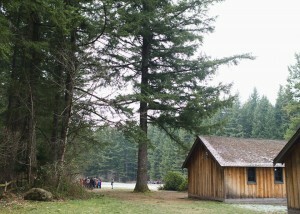 In 6th grade, I spent a week at Camp Waskowitz, pictured here. 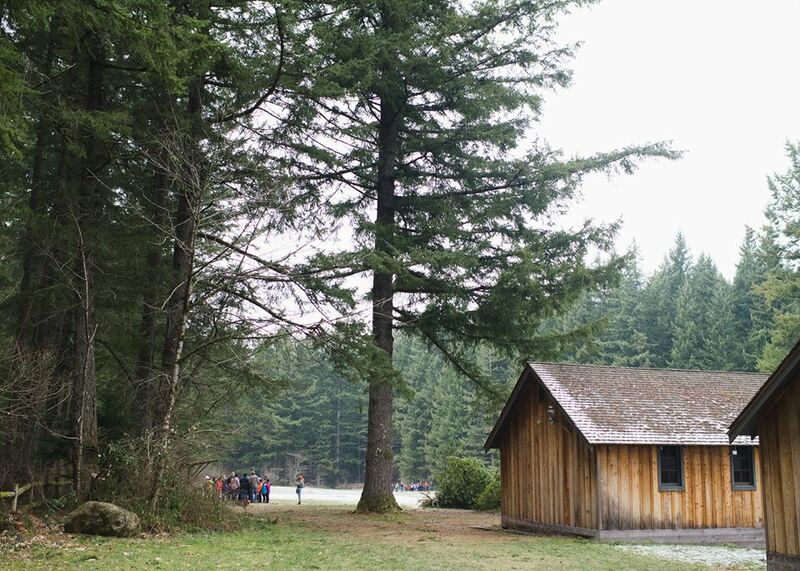 My teacher, Mr. Greer, sparked my love of the outdoors. Photo by Jana Kleitsch. Most of us can think of a teacher who made a tangible difference in our lives. My story is about my 6th grade teacher, Mr. Greer, who introduced me to the outdoors. My parents were not outdoorsy; their idea of roughing it was a hotel without room service! Mr. Greer exposed me to the amazing flora and fauna of Washington State and through him I discovered my love of the enviroment, specifically Marine Biology. This interest blossomed and eventually led me to major in Fisheries at the University of Washington, resulting in my career in environmental work before the birth of my oldest daugther. This dear teacher had a profound impact on the course of my life! As adults, we trust teachers to provide guidance, teaching, and care to our most precious resource - our children. Yet how do we show how much we appreciate the time and energy they put forth? 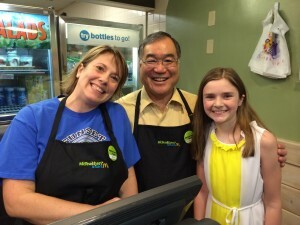 One of our family's favorite teachers and customers Mrs. Montgomery with the best principal in the world, Mr. Hamasaki! There are many, many ways to show teachers, principals, librarians, aids, and other school staff how much you appreciate what they do. Below are a few ideas I have discovered, but I know this is just the tip of the iceburg. Get creative! Idea #1: Make something personal. Have your child create a card, a picture, something to put on the teacher's desk or hang on the classroom wall. Bake goodies for the teacher to share in the staff lounge. Giving the teacher something thoughtfully handmade will make their day! Idea #2: Small gifts at holiday time and at the end of school.Many parents and students like to give small gifts to their teachers as appreciation, especially at Christmastime and again at the end of the school year. I know that teachers really look forward to and appreciate these gifts. When I am the Room Mom, at the end of the year, I ask the parents in my child's class to pool our money together for a gift certificate to our local mall. That way the teacher can buy a larger ticket item for their home or classroom, or maybe have a date night with their spouse! This gift is always appreciated, as the teacher can use in whatever way they want. Idea #3: Volunteer at school.Many teachers stay after hours planning lessons, grading papers, and attending meetings in order to keep up with changing student assessments and standards. By volunteering in the classroom, your time spent and tasks accomplished means less work for the teacher. For middle and high schools, consider helping with concessions at games, locker clean-outs, donating school supplies, or chaperoning events. 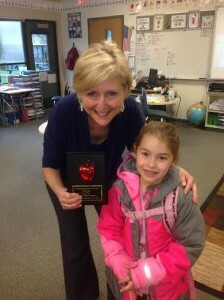 Macaroni Kid 'Teacher of the Month' for March, Mrs. VonCappeln. Idea #4: Nominate your teacher for an award. Consider nominating your favorite or your child's favorite teacher for an award. Many schools have an Outstanding Educator award that they give out each spring. Many local community groups also recognize exceptional teachers. We sponsor two local teacher awards - the Teacher of the Week by Star 101.5 radio station; and Macaroni Kids' Teacher of the Month. If the teacher wins, I guarantee this public recognition will make them feel appreciated! Idea #5: Participate in National Teacher Appreciation Week. Every year during the first week in May, we honor our teachers. Most schools take this time to shower their teachers and staff with flowers, goodies, notes, meals, and other gifts. As a parent, I always try to participate in helping with this week. If you are organizing your school's Teacher Appreciation Week activities, the National Education Association has some great ideas. Yes, it’s all crammed into one short week, but the teachers really love it! I hope these ideas inspire you to reach out to that special teacher or educator in your life and thank them for the positive impact they make! It really does make a difference!